This is a new feature on ChelseaFC360.com after every Chelsea game and we analyze how our players performed through out the 90 mins and rate them on a scale from 1-10. Chelsea had a comfortable win over Hull City at Stamford Bridge winning 2-0 by goals from Oscar and Lampard. The defense was resilient by not allowing goal or Petr Cech not being tested as he would have liked for much of the game. But, let’s see how all the players fared in this match….. The Czech goal keeper was not tested for much of the game as Chelsea were mostly on possession and John Terry and Gary Cahill did the job by holding the defense tight enough not to allow Hull players getting important shots on Cech. But, as Hull managed to have headers and shots from outside the box, CECH comfortably stopped every shot that came him way! Brana was brilliant as always playing at Right back. He did his defensive job and was a big threat going forward as Cahill covered his position. He was a bit unlucky when he was fouled in the box at 2nd half but, the Referee didn’t give away a penalty but, instead a Goal kick to Hull. Decent performance from the Serb! Gary Cahill made some brilliant interceptions and was a rock at the base of the defense along side John Terry. And he provided what Luiz is famous at by charging forward on few occasions and help the transition from Defense to attack. Great performance and Let’s hope we see this game by game from Cahill! John Terry was not called into action for most of the game as Cahill alongside him did most of the job but, Terry marked their no. 20 striker very well and didn’t give him any chances to win a 50-50 challenge physically. His leadership was ever present in a sunny after noon at the Bridge, but props to both Cahill and Terry to hold out Hull City from testing Petr Cech. I gave Ashley this rating because we didn’t see the attacking threat and forward runs he was good at for almost a decade of playing for Chelsea and Ivanovic was far more active in covering the flanks and helping the attacking wingers. But, a decent performance from Cole as he did his defensive duty to the maximum. The enforcer in midfield, he covered ground with gusto, biting at heels and winning possession back for his side. Rarely wasted possession when on the ball, feeding his team-mates, shielded his defense well and drove forward when he could. Missed an early penalty but redeemed himself with an outrageous, swerving free kick from 30 yards that flew into the back of the net. Always a threat bursting forward, and regularly stung McGregor’s palms. He nearly added his 2nd from a free-kick as his shot just whistled through the far post. 90 mins completed and an amazing display from Super Frank as always! Eden Hazard was stopped for some part of the game by their right back, Figuera. But, Eden is far more capable than that and should have done better in my opinion. He did very well dribbling and combined well with Oscar. But, Ashley Cole not advancing on the left flank more often deepened the chance of Hazard shining by creating a chance or two. Oozed quality, always searching for gaps and threading passes. The Brazilian was a conduit of creativity and class, and took his goal with enormous composure, prodding the ball underneath McGregor. A sub par performance from the Selecao star! Continued the excellent pre-season form that earned him a place in the starting XI, darting into space and probing the back line. Played a perfectly executed pass in behind the Hull defense for Oscar to open the scoring. An encouraging display. Often peripheral and hasn’t quite tuned into the same wavelength as the rest of Chelsea’s attackers. Won the penalty Lampard missed, and the free kick he scored, but didn’t have a single shot on target and never looked like scoring. Replaced by Lukaku. 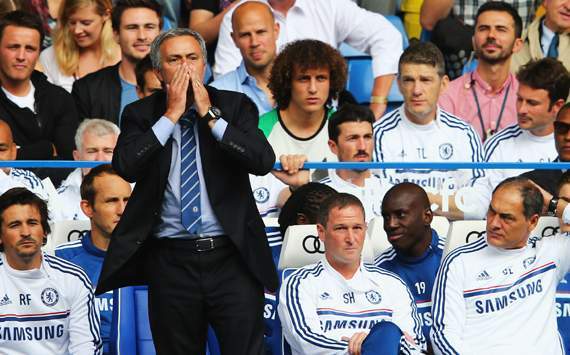 Did well but, just not good enough as Jose would like from his strikers. Watch out Nando! Schurrle was amazing through the 2nd half after coming on for De Bruyne. Almost scored a wonderful goal with a cute chip that had McGregor beaten. Was very much astute in defending as well as he charged back and helped Ivanovic at the latter stages of the game. Brilliant performance on his Premier League debut! Came on with five minutes of added time left to play as Chelsea looked to preserve their two-goal lead. Played as a further advanced place than he was used to, but provided great pace and energy in midfield. Even though he didn’t have enough minutes to create chances or score, He did his job just about in coming back and having touches of the ball. His delightful flick nearly created a chance for Schurrle to finish a chip. Great job in combining with 3 attacking mids and created a lot of chances in 25 mins played. It was a great performance by the team and here are the ratings. Please leave your comments and let us know what you think of our ratings and performance overall. KTBFFH!! High time d opponents so we really have a feel of our own performance as well………..wat do u tink ? Hi. Ivanovic deserves more than a 7.0. In my opinion he should get an 8.5 atleast. Brana won every ball in the air at the back when defending and often made the right decisions in attack. My man of the match. Terry a 6.5? Also under rated. It wasn’t just Cahill who made brave blocks and pressed well. Terry defended like the leader he is and deserves the same 8 Cahill got from you guys. If you remember correctly,in seasons past before Mourinho returned,our defenders actually dodged shots by turning their backs and just hoping the keeper stops it. Mourinho is back. First thing I noticed in pre-season was the defending of shots. Ground low shots were blocked by a player falling to the ground and taking the hit full on. Today there wasn’t much or any low shots at our goal but our centre backs took hits full on against the chest,head or legs. Terry and Cahill both recieved some bullets. Other than ratings,Chelsea stunned me in the first half. Wow. That was one of the best 35 minutes of football I have ever seen from Chelsea,beautiful football at its best. To think that this team hasn’t reached its full potential yet and already playing with such swagger and style,it scares me to imagine how good this side can become over time and actually play like that for an entire 90 minutes. I take it that these ratings were for the !st 30mins of the game becos personally I think we under performed, was expecting a wider goal margin….Ramires was tired, torres was his usual self no much of a threat, hazard was wasteful and feel under minimal challenge, generally I didn’t see the midfield cohesion after the first 30mins of the game. Congrats to the whole team.The first half was amazing for chelseas but was surprise that Hull hold their own at the second half.Meaning we need the kind of Mikel instead of Ginkel,mata instead De Brune and the team will make more waves for 90mins.Liuz should be considered against stronger opponents. Ok guys this is just an option that im throwing out.. IMO Lamps is undoubtedly a Chelsea scoring legend.. His streak of 204 goals say so.. But do you guys think that we should let our onfield striker (whoever it is) get a chance at taking penalties?? Please i’d like to know what your opinions are on this fact as well.. Ps. Im not including this just for the fact that lampsy was denied a penalty. We have a pecking order in the team mate with pens it is: Lamps, Mata, Hazard, Luiz, Torres with Free kicks its the same: Lamps, Mata, Hazard, Luiz they take them in turns for each game, just know that if Lampard is on the pitch he will most likely be taking them. I think the man of the match should be KDB. He performed well with some thunderous shots. Maynor Figueroa played left back (Ahmed Elmohamady played at RB), I felt Terry was our best defender and Ramires, Oscar or Terry deserved MoM, though Lampard was good from that free-kick I’d say the keeper made a mistake and thus he scored, I feel Lampard can score better goals and the Penalty which he missed was not upto his standards. Overall a good team performance. I hope the author realizes that sub par means below par (average).I don’t think that’s what the author intended. That said, I think Schurrle was overrated. And Ashley Cole deserved a 6.0. Lost possession several times, didn’t contribute anything to the attack and to me was the reason Hazard had an average game. A better team would have punished his lapses. We seriously need to prepare a replacement for Ashley ASAP, as he has lost it to me. as you have written thats its CFC360 rating, stick to it rather then copying it from goal.com . and even if u do copy have some dignity and give the credit. write your own views and stop being a cheat.